Tompkins Connect has shown its devotion to inspire the many young professionals in the workforce to do their part to benefit the non-profit community; now they are rewarding those young professionals with the recognition they deserve. 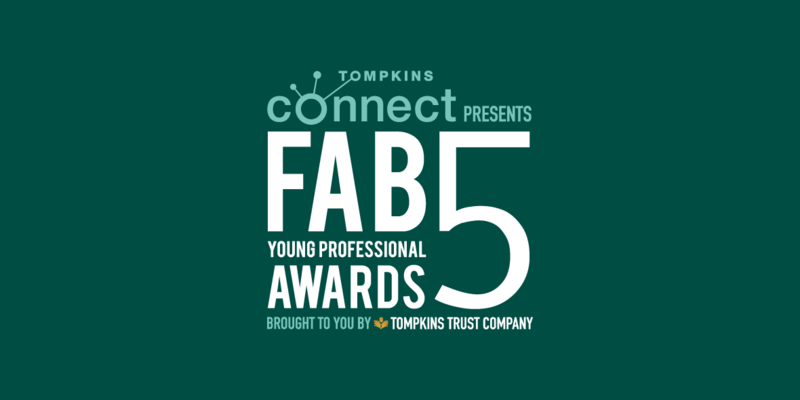 The purpose of the FAB5 Young Professional Awards are to celebrate the achievements of the young professionals in Tompkins County who are excelling in both the community and their respective fields. Sharing this vision with Tompkins Connect, Communiqué met with local leaders as well as spread the word to the community through press releases, social media and other outreach campaigns. With that in mind, we wanted to create a brand that reflects what the FAB5 Awards are all about. We began with creating a dark green background to show how both Tompkins Connect and Tompkins Trust Company (the sponsor of the event) are working together for this great cause. Serving as an effective example of co-branding, we placed the FAB5 logo in between the two brands to symbolize what they helped to create.